“Social media has become the ‘dial tone’ of our lives and people are exposing themselves, their families, and their employers,” said Lewis Howell, founder and CEO of Hueya. "We overshare too much information, making life far too easy for cyber criminals." Driven by rampant oversharing on social media, the human has emerged as the primary target for cyber criminals who use imposter scams and social engineering techniques to easily break through defenses. Hueya’s survey results indicated that half of respondents have been victims of cyber abuse, while a full 80 percent indicated they know victims of cyber abuse. “Cyber abuse” as defined by Hueya, includes identity theft, identity fraud, cyber crime, and cyberbullying. Cyber abuse can range from out-and-out theft, such as clearing out an individual’s bank accounts, to under-the-radar attacks such as online harassment. Because individuals and their workplaces are often so inter-connected online, cyber attacks involving individuals can easily spill over to the work place, and vice versa. Most criminals find that hacking the human is much easier than hacking a business. Social platforms enable humans to share and interact, but over sharing can make people vulnerable to online crime. Attackers prey on human weaknesses such as fear, trust, carelessness. For example, a posted photo of a child and pet can aid a cyber criminal by providing answers to personal security questions or by providing accurate locations of where one might live, work, and play. As detailed in the report, a penetration tester posing as an interior designer, easily scammed her way into a highly secure manufacturing facility using personal information about employees she found on social media. The open flow of personal information on social media directly impacts the security of businesses and governments. Even if an organization has good security processes and training, and even if people faithfully follow security procedures at work, they are typically unaware that actions in their private lives can put their employer at risk. Respondents in the Hueya survey are aware of the threats of cyber abuse—whether personally affected or knowing someone who has been affected. Findings reveal that more than a quarter of people, or 27 percent of respondents, know they are at risk for cyber abuse but don’t believe they can do much about it. More than 50 percent of respondents know or believe their identities have been stolen. Unfortunately, cyber abuse awareness is at best an infrequent topic in most families; only six percent of families have regular conversations about cyber abuse. Similarly, only seven percent of respondents indicated they receive cyber awareness training at work on a regular basis. 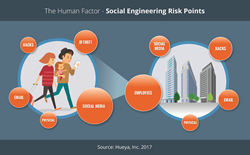 By working with individuals and companies, Hueya can use its powerful software monitoring tools to significantly improve individual online safety, both on the job and at home. Staying safe online in an always-connected, always-on social world requires taking action. As the scope and scale of cyber attacks continues to grow at an alarming rate, staying safe online requires cyber health prevention. The Hueya Report 2017: Cyber Abuse and the Human Factor includes 10 ways individuals and families can immediately reduce their risk of becoming cyber abuse victims. Hueya, Inc. (pronounced who-ya) is leading the charge to protect individuals and families, employees, and their missions against cyber abuse including identity theft, fraud, cybercrime, and cyberbullying. Hueya's online safety tools and software empower people to proactively take control of their online identity, secure their digital world, and make more informed decisions about what they share and click. For more information, visit hueya.io.